The speaking season is upon us once again! While I love getting to stay put (and getting things done) for long stretches of the summer, I also really love getting to travel around the country and connect with activists and students doing similar work. It’s an incredible learning experience for me, every time. I’ve got two events coming up in the next few weeks. I’m still booking events for the Fall and Spring, so if you’re interested in bringing me to your campus or community, please be in touch! More detail about my past speaking is available here. I’m also going to part of the third annual Feministing College Tour, and we’re also booking events for that. Details here. On September 28th and 29th I’ll be speaking at Kenyon College’s Take Back the Night week. I’ll be talking about sexual violence and social justice–basically why we can’t combat sexual violence without a social justice framework. 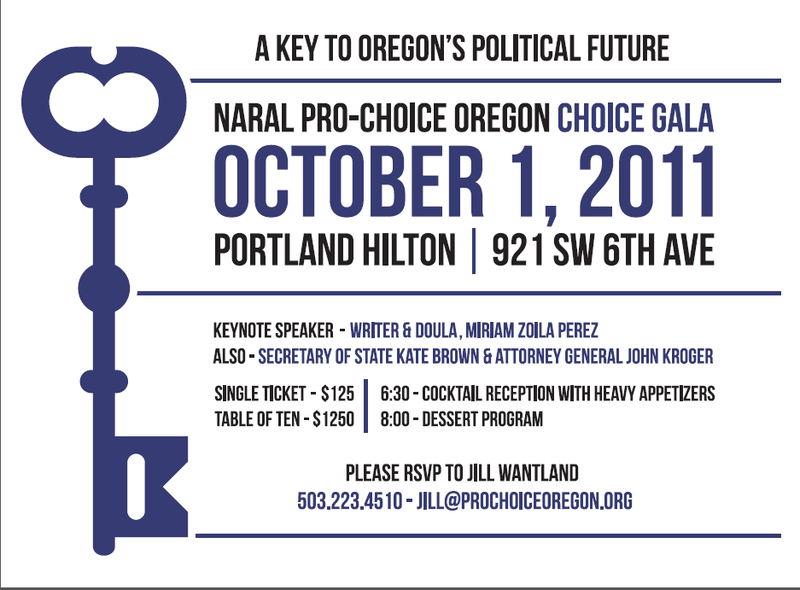 Then on October 1st I’m heading to Portland to be the keynote speaker at NARAL Pro-Choice Oregon’s Choice Gala. I’m super honored to be speaking along side the Oregon Secretary of State and the Attorney General. I’m most excited for that event because I’ll be talking about the work of Radical Doula, the work I discuss here, specifically my work as an abortion doula. I haven’t had the opportunity to speak much about that work and am really looking forward to it. NARAL sent an interview with me out on their listserve, and an excerpt of it is after the jump. I hope to see some of you there! NARAL: What would you tell someone who is feeling frustrated at the state of Reproductive Rights in America right now? Miriam: I would tell them that I’m frustrated too. Every day that I work supporting folks during abortion procedures and miscarriages I see how absurd the political circus around reproductive rights is, and how divorced it is from the realities of the procedure and from women’s lives. The decisions women make with their families and their [healthcare] providers are not political decisions. The only thing that keeps me hopeful is that the anti-choice community will continue its fast moving trajectory toward extremism, which will finally illustrate how anti-women their whole agenda is. Perhaps then they will lose political clout. We’re seeing this in the movement against contraception, in the racist billboards popping up around the country. Meanwhile, we have to keep fighting, and keep pushing toward what we really want–not beginning with compromise and ending up with losses. NARAL: Please explain the impact that full-spectrum doulas have on women’s reproductive choices and circumstances. Miriam: The goal of full spectrum doula work, or radical doula work (as I call it) is to provide unconditional support to pregnant and parenting folks. This support, which is traditionally provided by doulas during childbirth only, in our work also extends to women during abortions, adoptions and even miscarriages. We think it’s important that women have support during all of these phases–the full spectrum of pregnancy. Politically, this serves to reinforce that abortion is not an isolated event, that it is in fact just one aspect of a person’s reproductive life, and should not be silo-ed. Childbirth and abortion are intimately intertwined, which is why the work of a doula can cross these lines and experiences. For some it is a contradiction to support women during both abortions and births–for us, it is a natural extension of our work. After all, we know that it’s the same women who experience both things–why should they have support during one and not the other? To me, doula work is about addressing the deficiencies of our health care system, which leaves providers with little time to provide emotional support to their patients. Doulas have no other role that to be an ear and a hand to hold, something which can have a positive impact on any person’s experience. NARAL: You’ve been closely involved with the feminist movement, Latina rights, LGBT activism, and reproductive rights. Can you tell us about your experiences speaking in several different states, and why Oregon is important in the fight for progressive politics? Miriam: Each state has its own unique political context, but there is no place in today’s America that we can afford to be complacent. In my own travels, I’ve found that people in the more conservative states, places like Oklahoma, which leads the nation in anti-choice legislation, have the fire and energy to fight harder, because they feel exactly how bad things are in their own backyard. That’s important context, because there is more of our country that is like Oklahoma than Oregon. Things in our own state (I live in New York, another state without restrictions on abortion) may seem good in comparison, but that only gives the opposition more fuel for their fire. We need to focus on moving our own communities in the right direction, while supporting the national movement that is in dire need. And when it comes to abortion rights, women in other states may need us even more–many people have to travel to places like New York to get the procedures that they need. Where would they go if our state succumbed to restrictions and obstacles as well? Previous Article Help us shape a radical and full spectrum doula gathering! Excellent speech. Thank you for sharing your story.